Dr. Julie Trail opened her own practice to be able treat all age groups, from teens to seniors. Each patient will be listened to and treated with compassion. Treatment is individualized and personalized to help you maintain health or return to the activities you love. She provides treatments for a number of conditions including orthopedic, vestibular disorders and deconditioning. No two people are alike, whether they have the same diagnosis or not. Come in for a discovery visit to see if we are a fit. During your initial evaluation, she will complete a thorough history and functional evaluation to determine muscle strength and range of motion. She will work with you to formulate an exercise program which focuses on achieving your goals for therapy. You are a vital part of your recovery, including developing your goals and designing your personalized physical therapy home exercise program. Julie always gets the best outcomes for those that are as committed as she is. I am passionate about patient satisfaction and giving patients the treatment they deserve. This is the reason I decided to open my own clinic. With the rising costs of healthcare and limited reimbursements, some clinics are going to group therapy versus individualized treatments, or moving to treatments which are 20-30 minutes in length. At my clinic, you will get individualized treatment in a 60 minute appointment that is catered towards your individual needs. If you do not have health insurance or have a high co-pay or co-insurance, we offer a self-pay option. Colorado is a “Direct Access” state which means you can refer yourself for treatments. Many patients find that the cost of a self pay visit can be more affordable. Serving clients in Greenwood Village, Centennial, Englewood, Aurora, Lone Tree and Denver. I look forward to talking to you about your physical therapy needs. Give me a call (720) 448 – 6820 or drop me an email Julie@ApersonalizedPT.com. Julie has been practicing as a Doctor of Physical Therapy for over 17 years. She graduated from Arizona School of Health Sciences with a Doctorate in Physical Therapy. During her career she has worked in mainly private outpatient physical therapy practices. To gain additional exposure to the range of patient care, Julie worked as an inpatient physical therapist in a hospital on weekends. She has extensive continuing education experience including advanced training for vestibular disorders. In addition, Julie is a certified N’balance instructor. 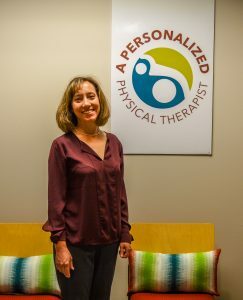 She is a member of the American Physical Therapy Association, Colorado Chapter and Private Practice Section.